Nutrition is one of the biggest factors in a child’s development and success, both in the classroom and beyond. Research shows that students who start their days with breakfast perform better academically, have fewer behavioral problems, better attendance and fewer visits to the nurse’s office. Unfortunately, many students start their day without the critical fuel they need to succeed. Thirteen million children across the country live in food insecure homes, not knowing if they will have regular meals available. Nationally, 1 in 6 children experience hunger – and in some states that number is higher. This is where school breakfast comes in. School breakfast provides a consistent, secure source of nutrition that feeds developing minds and bodies. Nationally, 14.6 million students eat breakfast at school each day, and over 11 million of those breakfasts are provided at no charge to the student. Meal programs, such as the School Breakfast Program (SBP), play a crucial role in making sure all kids get the food they need to focus and excel in the classroom. Not only do programs like the SBP ensure that all school breakfasts served follow federally mandated nutrition guidelines, but they also offer this important meal at a low cost (or no cost) to eligible students. Unfortunately, eating breakfast at school can sometimes carry stigma, preventing the most food insecure students from starting their day with the fuel they desperately need. McAllen ISD in McAllen, Texas, is one of the many school districts that has found a way to overcome this stigma with an alternative breakfast model. Their program is called Breakfast in the Hallway. “Districtwide, we were in the 50 percent range for breakfast participation, but our high schools were in the low 20s, so it was time for us to make a change,” McAllen ISD Food and Nutrition Services Director Alexandra Molina says. Over 82 percent of McAllen ISD students qualify for free and reduced meals. Molina adds that many families in their district receive food stamps and utilize other financial assistance programs. Breakfast in the Hallway increases access to breakfast for these students, without singling them out from their peers. All McAllen ISD high schools now have anywhere from 80 to 90 percent of students eating breakfast at school. Additionally, alternative breakfast models – like breakfast in the classroom or grab and go – have a powerful effect on students. When kids eat together, it creates a sense of community. This goes a long way towards student success and school meal participation. “I’m very proud of this program. I know that there’s a need for kids to eat. This has been a program that lets us overcome the stigma associated with school meals. It is now cool to eat school breakfast, and the end result of that is that hungry kids are part of the cool group and not having to search for food, and that to me is the most important part,” says Molina. Every day, over 56 million students enter classrooms across the country. School breakfast helps ensure that every one of these kids has access to the important nutrition they need to reach their full potential. Does your school serve breakfast in the classroom or through an alternative breakfast model? 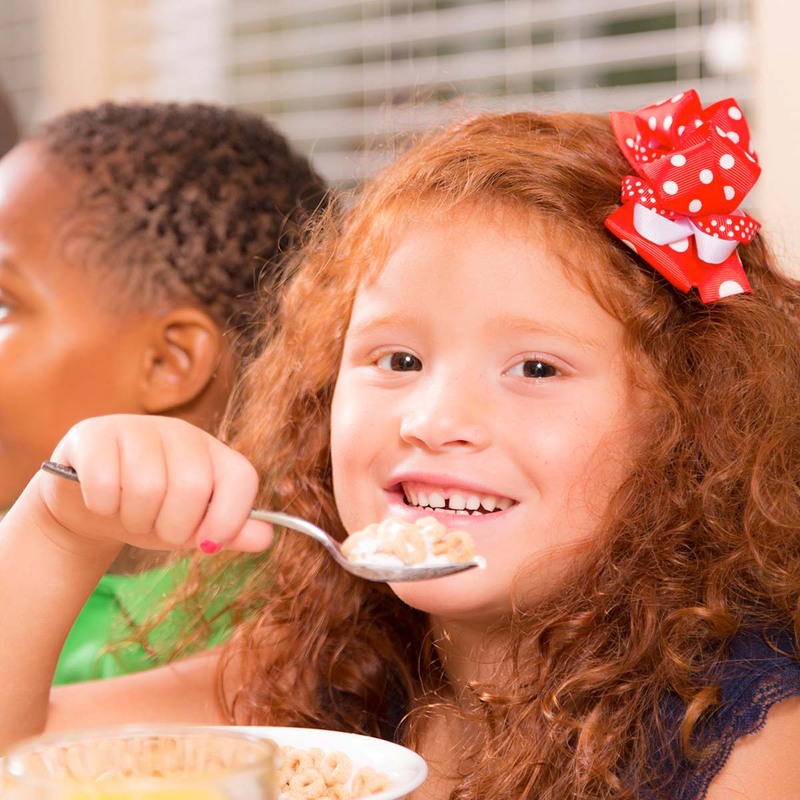 You can help fight hunger by encouraging your student to eat breakfast at school or referring your school to our breakfast grant through Dairy Dollars for Schools. Leslee has a background in marketing and communications that she puts to good use helping Dairy MAX's school marketing team reach teachers and school nutrition directors. She has been part of the Dairy MAX team since 2017. When she's not working, Leslee can be found spending time with her husband and their dog. Learn more about Leslee.